In order to use BPR with a background image you need to create a Background in the Light > Background sub-palette. You can use a full 360 degree panorama, or you can use a single view. The image used must be a panorama with a ratio of 2:1. In other words, the width must be twice the size of the height. For this feature, ZBrush uses the Equirectangular Projection method for the environment — the same one used for most HDRI (High Dynamic Range Image) work. This means that ZBrush is now able to load HDRI images. This includes support for 32-BIT color depth, which stores a wider range of color and light information compared to a classic 8-BIT image like a jpg. To load the Background image, click on the image thumbnail in the Light > Background sub-palette. Select the image yu want to use from the pop-up, or press the Import button to select an image file from disk. 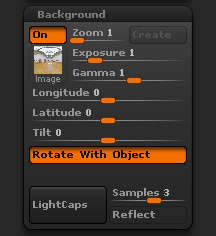 The Rotate With Object option means that the background and model will rotate together. You can turn this option off to align the model and background before turning it back on. For more information about using a panoramic background to creating lighting see the Background page. In the Light palette, open the Background sub-palette and click Create. This creates a new Background which is necessary for the next steps. It doesn’t matter what color it is. Turn off the Light>Background>Rotate With Object switch. Now make sure your model is NOT on the canvas – turn off Edit (press T on the keyboard) and clear the canvas (Ctrl+N). In the Texture palette, press Import and select the image you want to use. In the Texture palette, select the image you have just imported so that it appears in the large Current Texture thumbnail. Press the Texture>Image Plane>Load Image button. This will place your image on the canvas. Move mode will be on – switch to Draw mode. In the Transform palette, press the Snapshot button (the camera icon) or press Shift+S on the keyboard. This snapshots the image to the background created at (1) and means that it will still show during a BPR. Select your model in the Tool palette, and draw it on the canvas. Turn on Edit mode and position how you want. You may also need to change the selected material.